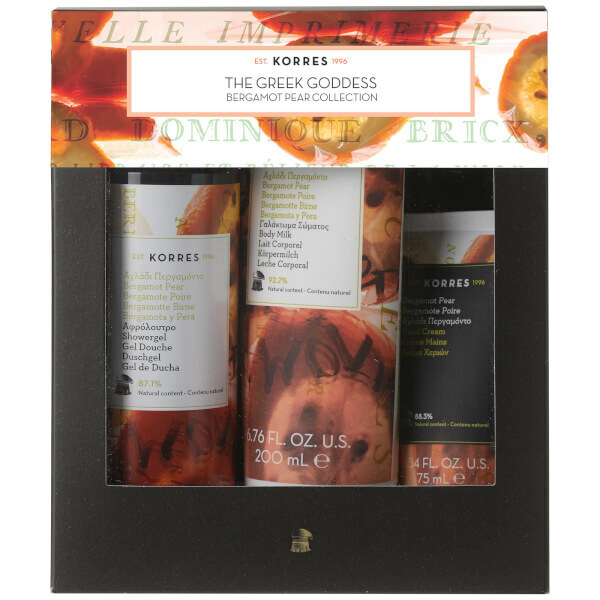 Treat your skin to the hydrating benefits of KORRES Natural The Greek Goddess Bergamot Pear Collection. Combining a shower gel, body milk and hand cream, the products works in synergy to leave skin feeling soft, hydrated and refreshed. It's formulated with Wheat Proteins which produce a protective film over the skin, maintaining levels of hydration to ensure that your skin doesn't dry out. Rich in Vitamin B2 to improve skin metabolism and aid the absorption of nutrients, as well as Vitamin B5 which boosts skin cell regeneration to keep your skin looking youthful, this nourishing, creamy-foam body wash will soothe and soften your skin with a long-lasting, moisturising effect. Enriched with antioxidant Aloe Vera to help stimulate collagen and reduce visible signs of ageing. 87.1% natural content. A nourishing body milk that delivers long-lasting hydration and enhanced softness. Enriched with natural ingredients, the velvety formula harnesses the calming properties of Almond Oil, along with active Aloe, Pro-Vitamin B5 and Shea Butter. Dry skin feels supple and nourished. 92.2% natural content. A lightweight and intensely moisturising formula enriched with Shea Butter and Almond Oil to help soften and comfort dry, rough skin. The hand cream delivers emollient properties to expertly nourish and repair hands; it melts effortlessly into skin, leaving no oily residue, and effectively hydrates and comforts whilst imparting a juicy perfume of Bergamot and Pear. Suitable for all skin types. 88.3% natural content. Shower Gel: Apply to wet skin and massage into a lather. Rinse thoroughly. Hand Cream: Massage into hands as and when required. Shower Gel: Aqua/Water/Eau, Sodium Laureth Sulfate, Cocamidopropyl Betaine, Sodium Cocoyl Isethionate, Coco-Glucoside, Glyceryl Oleate, Parfum/Fragrance, Aloe Barbadensis Leaf Juice, Alpha-Isomethyl Ionone, Althaea Ocinalis Root Extract, Arginine, Benzyl Alcohol, Butylphenyl Methylpropional, Castoryl Maleate, Guar Hydroxypropyltrimonium Chloride, Hydrolyzed Wheat Gluten, Imidazolidinyl Urea, Lactic Acid, Limonene, Phenoxyethanol, Polyquaternium-7, Potassium Sorbate, Sodium Dehydroacetate, Sodium Gluconate, Tocopherol.Aqua/Water/Eau, Sodium Laureth Sulfate, Cocamidopropyl Betaine, Sodium Cocoyl Isethionate, Coco-Glucoside, Glyceryl Oleate, Parfum/Fragrance, Aloe Barbadensis Leaf Juice, Alpha-Isomethyl Ionone, Althaea Ocinalis Root Extract, Arginine, Benzyl Alcohol, Butylphenyl Methylpropional, Castoryl Maleate, Guar Hydroxypropyltrimonium Chloride, Hydrolyzed Wheat Gluten, Imidazolidinyl Urea, Lactic Acid, Limonene, Phenoxyethanol, Polyquaternium-7, Potassium Sorbate, Sodium Dehydroacetate, Sodium Gluconate, Tocopherol. Body Milk: Aqua/Water/Eau, Caprylic/Capric Triglyceride, Prunus Amygdalus Dulcis (Sweet Almond) Oil, Glycerin, Hydrogenated Polydecene, Aloe Barbadensis Leaf Juice, Glyceryl Stearate Citrate, Ammonium Acryloyldimethyltaurate/Vp Copolymer, Butyrospermum Parkii (Shea Butter), Decyl Cocoate, Parfum/Fragrance, Alpha-Isomethyl Ionone, Althaea Officinalis Root Extract, Butylphenyl Methylpropional, Caprylyl Glycol, Citronellol, Distarch Phosphate, Glycine Soja (Soybean) Oil, Limonene, Linalool, Magnesium Pca, Manganese Pca, Panthenol, Phenoxyethanol, Rosmarinus Officinalis (Rosemary) Leaf Extract, Sodium Gluceptate, Sodium Pca, Zinc Pca. Hand Cream: Aqua/Water/Eau, Glycerin, Glyceryl Stearate, Caprylic/Capric Triglyceride, Ethylhexyl Palmitate, PEG-100 Stearate, Butyrospermum Parkii (Shea Butter), Hydrogenated Polydecene, Propylheptyl Caprylate, Cetearyl Alcohol, Prunus Amygdalus Dulcis (Sweet Almond) Oil, Helianthus Annuus (Sunflower) Seed Oil, Aloe Barbadensis Leaf Juice, Distarch Phosphate, Orbignya Oleifera Seed Oil, Acrylates/C10-30 Alkyl Acrylate Crosspolymer, Alpha-Isomethyl Ionone, Ammonium Acryloyldimethyltaurate/VP Copolymer, Benzyl Alcohol, Butylene Glycol, Butylphenyl Methylpropional, Calendula Officinalis Flower Extract, Cetyl Alcohol, Citronellol, Fragrance (Parfum), Limonene, Linalool, Nymphaea Coerulea Flower Extract, Panthenol, PEG-20 Stearate, Phenoxyethanol, Potassium Sorbate, Punica Granatum Fruit Extract, Sodium Benzoate, Tetrasodium Glutamate Diacetate, Tocopherol, Tocopheryl Acetate.